on our ability to provide an outstanding level of care to our clients. We have a computer dial-in system, which confirms the arrival and departure time of our mature carers through the use of a unique to the carer, and free to the client, telephone number. 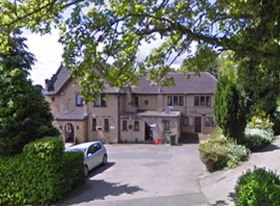 Ladies in Waiting is a domiciliary care agency, based in Ilkley, providing care, companionship and mobility to elderly people in their own homes, enabling them to live independently. Whether the client is temporarily out of action, or needing long-term care or assistance, we assess the personal needs of each individual, and create a plan to ensure that the best care is provided. We aim to maintain the client's independence, dignity and freedom. Our unique service guarantees visits of at least one hour, at the specified time the client’s want. Our client’s know that we always arrive on time, and that we always send the same care workers. Ladies In Waiting operates a unique dial-in telephone system, that confirms the arrival time and departure time of our care workers at a client’s home. This secure telephone system uses a 0800 telephone number which is absolutely free and does not cost a penny to our client’s, or even appear on our client’s telephone bills. What this system creates is a safe, secure, and reliable ‘real-time’ monitoring of all of our staff, which ensures that we always know that our staff members have arrive safely and at the time requested by our client’s. Dear Teresa and all the wonderful carers My brother and I would just like to let you all know how very we appreciated your kindness and helpfulness over the past few years; Firstly in helping my father and lately my mother, it has given us much peace of mind to know you were always on hand to step in wherever needed and completely reliable. My mother was much comforted by her carers during her life and came to regard her carers as friends as well. Mum was very fond of ‘her ladies’. With very many thanks to you all, and the very best wishes for the future. Dear Teresa I am writing to thank you and your staff for the wonderful level of care you provided for my mother. Ladies In Waiting have been my mother's principal carers for many years and i deeply appreciate the commitment, integrity and compassion of all your staff. Your Ladies have shown initiative and sympathy as situations arose, and as I live some distance away this has continued to give me peace of mind. Please convey my deepest gratitude to everyone at Ladies In Waiting. To Everyone at Ladies In Waiting On behalf of my brother and myself, I would like to thank all carers who have looked after mum over the past few years. Mum’s care has been superb and we are very grateful to everyone who has not only cared for mum, but also for also becoming mum’s friends. Mum is now very happily settled in the Nursing Home, it has been a good move for her, and would love to see any of her carers if they would like to come and visit. We feel we did the best we could to keep mum in her own home as long as possible, and thank you for helping us to do that. Dear All My wife was struck by Ramsey Hunt Syndrome, which destroyed overnight her balance and affected her senses in other ways. It is therefore unwise to leave my wife alone for long, and there are household routines which my wife can no longer perform. In my absence my wife has been assisted by the carers from Ladies In Waiting for two years. During this time our relationship with the management of Ladies In Waiting, and their carers has been entirely happy. The carers are regular and without exception have been capable, sympathetic, understanding, and above all, friendly. We have complete confidence in them and they have enriched our lives. Thank you all. Dear All at Ladies In Waiting The service provided by Ladies In Waiting during my mothers recent illness (which lasted for a 7 month period), was absolutely outstanding. Punctual, professional, informative, and efficient at all times. With a very high level of compassion and care we received, means I would not have the slightest hesitation in recommending Ladies In Waiting to any potential clients. Dear Ladies In Waiting I am very happy to send you my comments as I so impressed with Ladies In Waiting who looked after my late father. They combined complete professionalism with great kindness, humour, and compassion, and made the last two years of his life a joy for him. He thoroughly looked forward every day to the arrival of his visiting lady, and Brenda and Susan in particular became real companions and friends to him. I was so impressed with the flexibility and efficiency of Ladies In Waiting which was combined with the human touch; whenever I had an emergency they were always there. I was not only kept fully informed about my father's condition, but also treated with compassion myself and given helpful and timely advice. Neither Dad or I could have managed the last two years without the help of your service. All the very best. The Raikes and Sunningdale have extremely good qualities for caring for differing needs. The Raikes has a 'genteel' clientele, whose elderly residents may have the symptoms of dementia but who may also have limited mobility, or they are becoming physically frail and need a higher level of physical assistance from our caring staff. The Ilkley Dementia Café, can you make a difference? 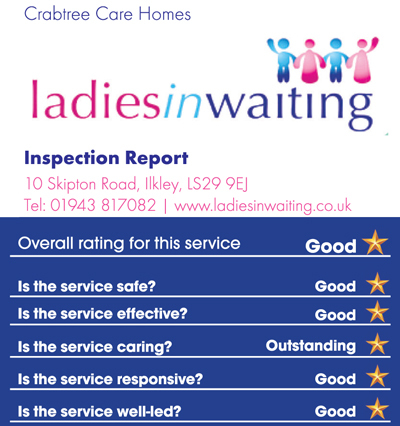 Ladies In Waiting is accredited & inspected by the Care Quality Commission. Our care homes have been awarded the Government's "Investor in People" award, which shows our commitment to residents and staff. Copyright © 2016 Ladies in Waiting.